Role: Teaching new skills to children to improve their own fitness and techniques in a range of different sports. Ethiopia is famous for its world class athletes. By taking part in our School Sports project, volunteers will not only be involved in learning new skills and improving their own fitness, but will also be able to pass on their own sports knowledge by teaching local children. Volunteers who join this project can choose to combine athletics and school sports or just focus on the school sports element of the project. You don't have to be an expert sports coach to take part; an interest and enthusiasm in sports and athletics in general is all that's required. By taking part on this project volunteers gain a large amount of valuable work experience, working alongside some extremely skilled staff and athletes. Volunteers can take part during a gap year, on a holiday from work, as part of your studies, or as part of a career break. This project focuses mainly on school sports. 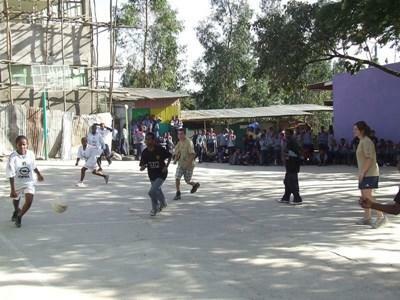 The sports that are normally taught in schools in Ethiopia are football, basketball, athletics, volleyball and aerobics. As a volunteer, you will be assigned to an experienced supervisor who will provide you with support and guidance. You will start out by shadowing and helping local staff, but depending on your ability and confidence, you can have your own lessons or at the school’s request, you may be asked to coach a talented young team who take part in inter-school sports competitions. Each class has two sports lessons per week, so your day will be spent teaching a variety of age groups, but typically the children are aged 11-16. As you work with the children to develop their talents, you will not only witness how their increased self-esteem impacts on their personal relationships, but you will create ever lasting memories and friendships. This project is unavailable during the school holidays, from July to September. As an addition to the School Sports project, volunteers are given the opportunity to train a few mornings a week with a local Ethiopian running club. If you choose this option, you will train in different locations with one of 20 long distance athletes and prepare for an official road-race event. While running, you'll be able to take in the extraordinary landscape and scenery. This option is on a request basis only, so to avoid any disappointment please let us know that you would like to join the running club when applying for the School Sports project. If you have qualifications or experience in this field then we can make use of your skills. 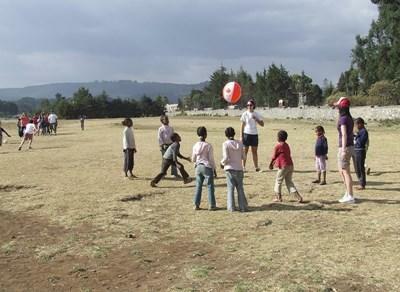 Read more about the opportunities for skilled volunteers in Ethiopia.